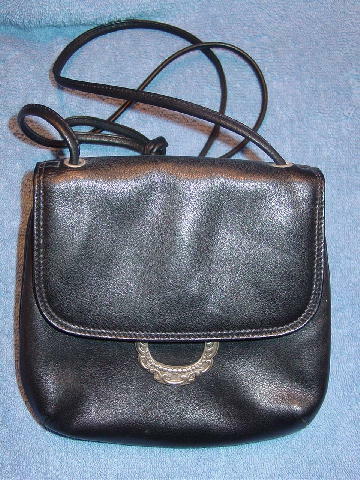 This black leather purse is by Fossil. It has a shiny black fabric lining (which has some red makeup marks on the interior of the lid and right side) that has a tone-on-tone black Fossil written all over. It has an envelope styling with a magnetic closure hidden under the flap. There is an antique silver-tone metal ornament on the front face below the flap. It has a 44" long leather shoulder strap. The interior has a black zipper pocket and below that a leather Fossil tag and serial number. The back has an open 3/4 lined compartment.